The macroconidia of this Fusarium complex are fusiform, slightly curved, pointed at the tip, mostly 3 septate, basal cells pedicellate, measuring 23–54 μm x 3–4.5 μm. This complex accounts for about 20% of human fusarium infections. What Fusarium species complex is this? 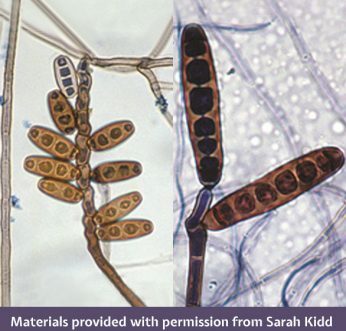 The Fusarium oxysporum complex contains at least 5 phylogenetically distinct species and accounts for about 20% of human infections caused by fusaria. It can cause localized or deeply invasive life-threatening infections in humans and other animals. 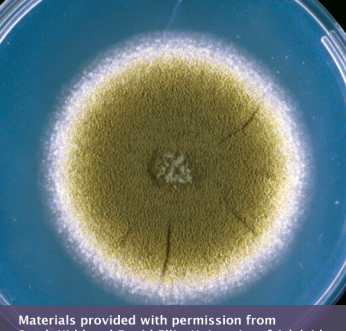 The majority of Scedosporium infections are mycetomas, but can also involve the eyes, ears, CNS and lungs. 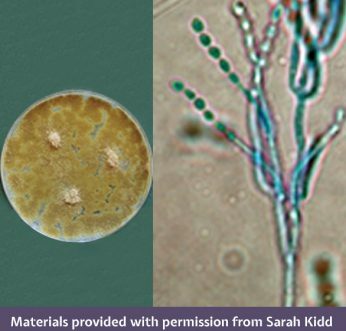 Which Scedosporium species is in the photo? 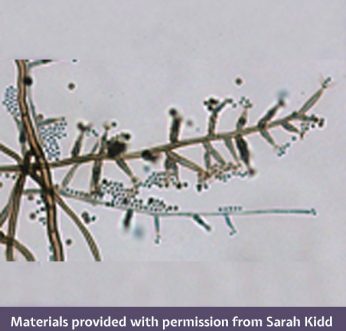 Scedosporium apiospermum and Scedosporium boydii (formerly Pseudallescheria boydii) are now recognized as separate species and along with S. aurantiacum are the principal human pathogens. Colonies of S. apiospermum are fast growing, greyish-white, suede-like to downy with a greyish-black reverse. 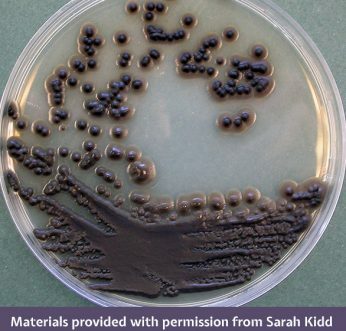 Unless confirmed by DNA sequencing, reporting as ‘Scedosporium apiospermum complex’ is recommended. 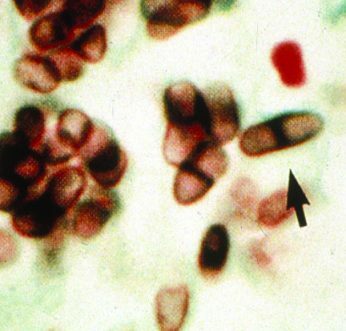 This Giemsa-stained touch smear shows the typical septate yeast-like cells (arrow) of which fungus? This species exhibits thermal dimorphism, is endemic in Southeast Asia and southern China, and its infection is characterized by subcutaneous abscesses and papule-like ulcers. Previously known as Penicillium marneffei, T. marneffei exhibits thermal dimorphism and is endemic in Southeast Asia and southern China. 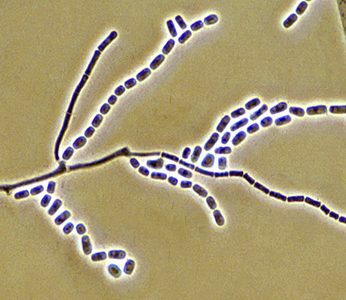 Talaromyces marneffei is the only dimorphic species of Talaromyces (or Penicillium), which grows as a yeast at 37°C. It produces a red soluble pigment on general media and conidiophores have flask-shaped to acerose phialides. Which species of Mucor (in photo) differs from other species in its formation of short circinated, branched sporangiophores bearing brown sporangia and its ability to assimilate ethanol and nitrates? The genus Mucor has about 50 taxa, but only a few thermotolerant species are of medical importance. Most infections reported list M. circinelloides and similar species such as M. indicus, M. ramosissimus, M. irregularis and M. amphibiorum as pathogens. 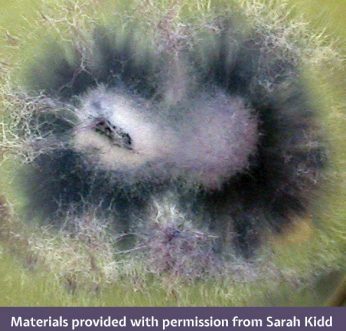 The controversy surrounding which species name to use for Rhizopus oryzae versus Rhizopus arrhizus has been resolved in favor of the latter. The important medical pathogens are reduced to just R. arrhizus and R. microsporus, which account for ~60% of the reported mucormycosis cases. 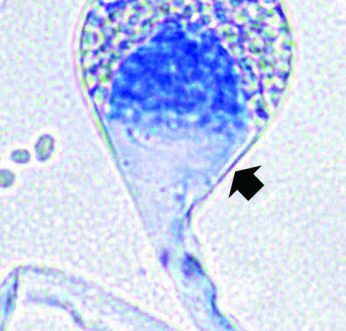 This is a typical pyriform-shaped sporangium with a conical-shaped columella and pronounced apophysis (arrow) of which opportunistic pathogen? It’s known to cause pulmonary, central nervous system and skin infections in animals and humans with impaired immunity. The genus Lichtheimia currently contains 5 mostly saprophytic plant decaying and soil-borne species. Lichtheimia corymbifera is the principle pathogen causing human and animal infections. Colonies are fast growing, floccose, white at first becoming pale grey, and up to 1.5 cm high. These pink to dark brown colonies have been linked to cases of subcutaneous infections, keratitis, sinusitis, peritonitis and canine osteomyelitis. What fungus is this? Colonies of Coniochaeta hoffmannii are flat, smooth, moist, pink to orange, with regular and sharp margin; reverse pink. It also forms adelophialides like Phialemonium, but in Coniochaeta, these conidiogenous cells show conspicuous collarettes, and the colonies are usually pink-salmon to dark brown. 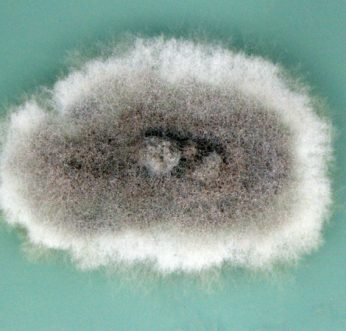 The fungus in this photo, showing rectangular arthroconidia separated by disjunctor cells, is typically found in California’s San Joaquin Valley region and Mexico, and can cause ‘valley fever’. What is it? Coccidioides immitis is typically geographically limited to California’s San Joaquin Valley region and Mexico. Microscopy shows single-celled, hyaline, rectangular to barrel-shaped, alternate arthroconidia, 2.5–4 x 3–6 μm, separated from each other by a disjunctor cell. 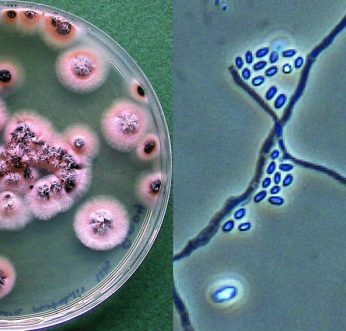 This fungus now appears to be expanding its range within the USA and has been found as far north as the Washington State. P. richardsiae is characterized microscopically by (1) hyaline conidia that are allantoid or cylindrical, and form on inconspicuous, peg-like phialides on thin-walled hyphae; and (2) brown, thick-walled conidia that are spherical to subspherical and form on dark brown, slender, tapering phialides with flaring collarettes. Key features of Paecilomyces are long, slender, divergent phialides and culture pigmentation. P. variotii colonies are powdery to suede-like, funiculose or tufted, and yellow-brown or sand-colored. Microscopic examination will show conidiophores bearing dense, verticillately arranged branches bearing phialides. 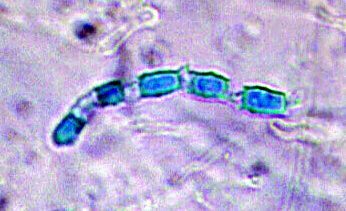 Exserohilum rostratum conidia have prominent, dark basal and distal septa, and a strongly protruding truncate hilum. 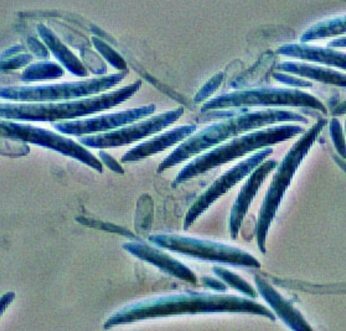 Mature conidia are straight, slightly curved or bent and cylindrical to rostrate. They typically contain 7 to 9 pseudosepta (range, 4 to 14). T. marneffei (formerly Penicillium marneffei) is endemic in Southeast Asia. It produces a distinctive red soluble pigment on general media and exhibits thermal dimorphism. On brain heart infusion agar containing blood, incubated at 37°C, colonies are rough, glabrous, tan-colored and yeast-like. 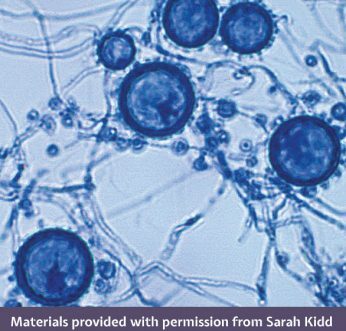 This shows the microscopic morphology of the saprophytic or mycelial form of H. capsulatum with its characteristic large, rounded, single-celled, tuberculate macroconidia and smaller microconidia. As H. capsulatum cultures are a severe biohazard, either exoantigen test or DNA sequencing is preferred for lab safety. F. oxysporum complex colonies have white aerial mycelium, becoming purple, with discrete orange sporodochia present in some strains; reverse is hyaline to dark blue or dark purple. 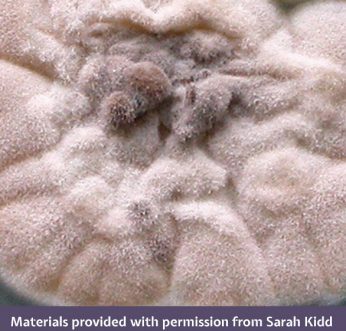 The fungi belonging to Exophiala and related genera are still not clearly defined, and remain difficult to identify. Because of their phenotypic plasticity, it’s essential to examine isolates on media like potato dextrose agar to promote the formation of hyphal elements, and to use slide culture preparations. P. parasiticum cultures are usually slow growing, suede-like with radial furrows, and initially whitish-grey becoming olivaceous-grey with age. Maximum growth temperature is 40°C. 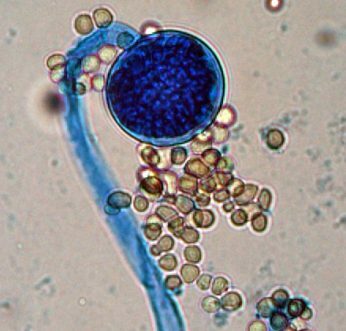 Human infections caused by P. parasiticum include subcutaneous abscesses, thorn-induced arthritis, endocarditis and mycotic keratitis. This is a photomicrograph of Geotrichum candidum. Which of the following is not present in the field of view? Geotrichum species do not produce blastoconidia, conidiophores or pseudohyphae. Arthroconidia of G. candidum are formed as hyphal elements are progressively compartmentalized by fragmentation of septa. Conidial secession is by schizolysis of a double septum and concomitant rupture of the original outer hyphal wall layer. 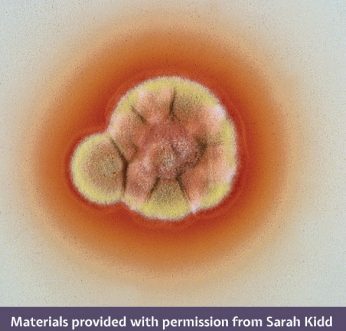 Which of the following features is not seen in this microscopy image of Bipolaris australiensis? 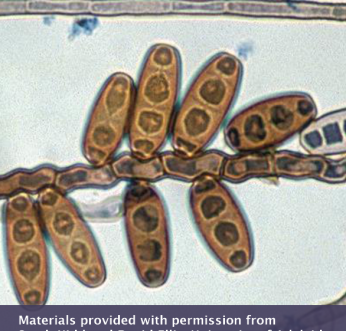 This microscopy image of Bipolaris australiensis illustrates its typical features of sympodial development of pale brown, fusiform to ellipsoidal, pseudoseptate poroconidia on a geniculate or zig-zag rachis. 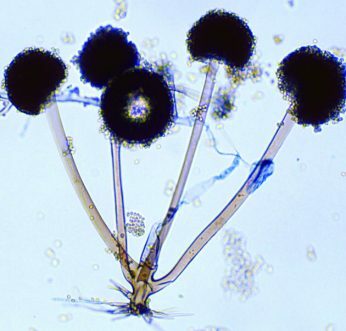 Aspergillus fumigatus is a distinctive species that can be recognized by its broad, velutinous, bluish colonies bearing characteristic, well-defined columns of conidia. 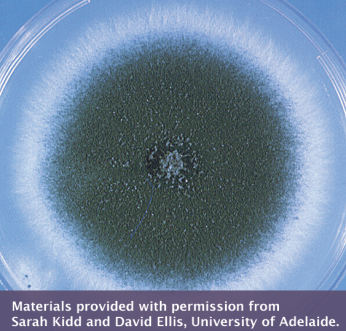 Spreading yellow-green colonies are characteristic of cultures of Aspergillus flavus. On Czapek Dox agar, colonies are granular, flat, and often show radial grooves. Initially, colonies are usually yellow but quickly become bright to dark yellow-green with age.